Root cellar in my renewable home – why? 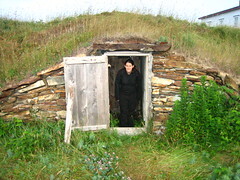 For quite a long time I thought of building a root cellar for my renewable home. In this article I will describe you the basics of my idea, explaining why I want to built it so much. I must honestly say that I want to build my home as off-grid capable as possible because I believe that in a couple of years our world will change substantially because of the Peak Oil. When the oil becomes three… four… ten times more expensive than it’s today, I expect a lot of trouble with supply of the energy from the grid. I am also a bit worried that in that point a global war will be started to fight over the remaining fossil fuels. Maybe that’s because I played too much Fallout in my youth, or maybe I’m a bit paranoid. Nevertheless, I read a great book on building fallout shelters, and I want to implement some ideas of such fallout shelter to my dugout. The other goal I want to accomplish is to have a place to store a lot of food I will harvest from my land. And to save money on storing stuff in a cool place. I might also place there a refrigerator to save a bit on energy used to run it. I will post here more details when I have any. At the moment I am scrolling through various DIY and off-grid sites to find a good blueprint for building a root cellar. The building will probably begin in 6 months, or so, when the winter is over. One Response for "Root cellar in my renewable home – why?"